Remember the days of dudes walking through the neighborhood carrying huge blaring boomboxes on their shoulders? IPods and other pocket-sized music players have effectively ensured that the boombox trend is completely dead, but New York studio Ray Kingston Inc. is bringing it into the 21st century. 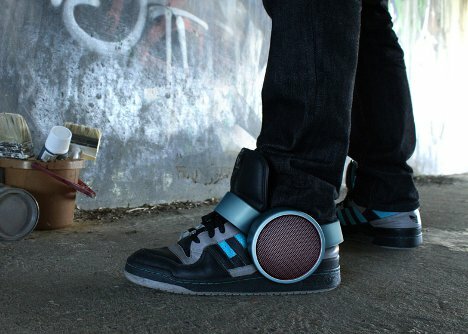 Their Sneaker Speaker is a wireless, battery-powered sneaker that fits over a shoe. It’s paired via Bluetooth with a mobile phone, iPod or tablet so the music can stream endlessly. The speaker attaches to the shoe via one or two straps around the ankle. Even when you aren’t walking around sharing your tunes with everyone in earshot, the speakers come with a stereo input and AC adapter port so you can use them at home like regular speakers. See more in Audio & TV or under Gadgets. December, 2012.